The Nephrolepis, or Lemon Button Fern, is one of the most pleasant small ferns an Indoor Gardener can grow. Once it finds its place in your home, and you establish its care cycle, it's pretty much care-free. When handled, there's a lemon scent, which - in addition to its yellowish gold color - gives the fern its name. The Nephrolepis is the smallest of the Boston ferns and good for the beginning Indoor Gardener. The plant usually starts off in a small pot of no more than 4 inches, and never progresses much out of a 6- to 8-inch container. Eventually, you might need to pot up to a 10-inch, but that's for an older plant. The Lemon Button Fern does well in terrariums, also. Be careful not to confuse it with the Button Fern, Pallaea rotundifolia, which has glossier leaves and requires very different care. From a distance, it's easy to make the mistake. A Sad Story of Mistaken Identity. I've had a little Button Fern for a few months, naming him "Mr. Pesky" because nothing I did for him seemed to make him happy. We tried four different locations and two different soil mixes. He seems to like the kitchen table best, but that's a place he can't stay. There's a lot of bright, indirect light there, so I'm looking for a similar space in another room. He's also been quite jealous of the other plants I've repotted and though he wasn't root-bound, I finally potted him up. He hated that container, though, drooping and dropping fronds. The second is a terracotta pot that I put into an outer tin container, with stones on the bottom for humidity. You can see the process in the photos. He perked up a bit, but that was short-lived. I swear, though, that he wanted "bling." Who would ever imagine a houseplant wanting Bling? Just on a whim I wrapped a very colorful, wiggly, thin gift ribbon around the tin planter and Mr. Pesky looked remarkably better. That ony lasted a while. At this point I was getting rather frustrated, not knowing what else to do for him. I checked all my sources - it seemed I was following all the directions for correct Button Fern care. He looked just like the photos - almost. Something on the edge of my awareness had me go a bit deeper in my Internet research. "Lemon Button Fern" with a different taxonomy altogether kept popping up in my searches. On a whim, I clicked on some of those pages. These photos looked like my plant, too! On closer examination, though, after enlarging the photos and reading more details I realized that it was no wonder that my Button Fern was so pesky - he wasn't a Button Fern at all! Now that he's properly named and the watering schedule, humidity level, and soil mixture adjusted, my Lemon Button Fern - Nephrolepis - is recuperating very well. The lesson I learned: Pay more attention to the plant and less to the books! Second lesson learned: Try not to buy plants in general home-improvement stores whose labels, at most descriptive, say "Fern." Watch the base of the fronds. If they turn brown, you're either under- or over-watering. 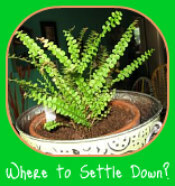 Care for the Lemon Button Fern is similar to that for any of the Boston Ferns, but as with any plant, pay attention to its particular needs in your location. As long as you don't mistake the Nephrolepis for the Button Fern as I did, this is an easy-to-get-along-with houseplant for the beginner Indoor Gardener. Plays well with others, either in terrariums or combination plantings. Due to its small size, the Lemon Button Fern can easily live on a side table in a sitting area or serve as a low-height centerpiece during an intimate dinner. and how to maintain health for your ferns. both indoor and outdoor enthusiasts. Indoor-Gardener.com reports information from research and does not guarantee any of the plants mentioned, for medicinal, decorative, or other uses. Neither the FDA nor any physicians have endorsed the uses of plants mentioned on the website. Use plants as food or medicinal products only at your own risk. (at least according to some sources).